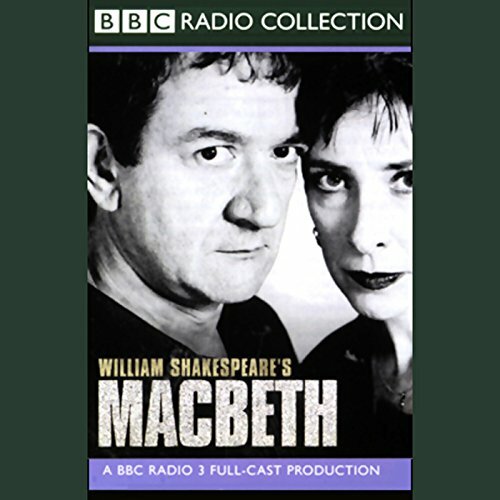 The poetic richness of the language in "the Scottish play" is enhanced through the medium of radio to bring new depths of anguish to the tortured reasonings of Macbeth and his wife. Revitalised, original, and comprehensive, this is Shakespeare for the new millennium. Most of the characters were portrayed the way I imagine; I particularly loved the playfulness of the witches (vs. a decrepit croniness). I didn't like the voice for Macbeth. Most disappointing to me is that, gosh, maybe 20%, or more, of the play is cut out. Too much. It's already a short(ish) play. In general I would say the BBC collection has the highest most consistent quality and production; however this is an exception and it pains me to say it because it is one of my favorite plays with only Hamlet in contention. While I disagree now and then with certain line readings and emphasis, in general as i say, BBC does a wonderful job. BUT, with Macbeth I think they totally miss the mark with tone, emphasis, intensity as well. To make matters worse they trim lines from a couple scenes of an already short play for no good reason as they are content to go several hours with Lear and Hamlet and all the rest. And whereas other BBC productions explore various emotional readings/interpretations of lines, in this they are all in a slap dash hurry to get to dinner or something. All the lines seem rushed through; there is barely any break between scenes to the point some seem to run together. I would have to say that there is no actor or character that seems thoroughly interested in the story or being in this production. Sorry BBC, love everything else, but there are far better Macbeths out there, unfortunately not all of which are on audible. I would like to have strictly audio of the Jeremy Brett/Piper Laurie production and would love audio from the Nicol Williamson production. while both have a moment i would like done differently, over all they are great and Nicol is one of the best Macbeths I've seen with some great line interpretations. I have never felt it right when Macbeth is presented as an emotionally weepy type (like he is so often portrayed in the murder aftermath scene and Nicol falls into this also) and Nicol portrays him as a brooding angry warrior type which is more in fitting with the themes. It was very well acted, however, I was disappointed that so much of the witch dialogue was surpassed. What a great way to "read" Macbeth. Being done in a play format brings it to life and allows the "reader" to fully enjoy the work of a genius while sitting in the comfort of his or her home. This is a great version, full of emotion and drama. Having a full Scottish cast gives it a feeling of authenticity and realism. Ken Stott and Phylis Logan in the leads give compelling performances that bring the language to life. Recommended for any student of Shakespeare. Superb version of the Scottish play! great production I first heard this on Radio 3 drama on Sunday, well worth the purchase, and highly atmospheric.